Situated in the heart of downtown, The Copper Kettle is one of Regina's longest standing, locally owned businesses. A downtown landmark housed in a heritage building designed circa 1920s, the Copper Kettle Restaurant is a long time fixture on Regina’s restaurant scene. With floor to ceiling windows capturing beautiful views of Victoria Park it has been owned by the Gardikiotis family for over 50 years. Recently renovated with stylishly casual, warm and intimate décor, it is renowned for award winning gourmet pizzas, authentic Greek specialties, shareable appies, gourmet sandwiches, steaks and chef’s features. Also serving an extensive list of wine and North American small lot beers, it’s the perfect destination for business lunches, family and corporate gathering and special events alike in the private dining room for groups of 10-50. Outdoor patio and underground parking available. We deliver city wide from our central location. We look forward to your visit. Squid lightly breaded with seasoned flour & served with tzaztiki. Crispy wings tossed in your choice of greek herbs & spices, spicy sriracha or bbq sauce. House lager chips topped with curry and baked with cheese. Crispy fries topped with grilled chicken+buffalo sauce+cheese & baked. Grilled chicken breast, baby greens, cheddar, tomato & aioli. Grilled vegetables wrapped in a flour tortilla with cheddar & hummus. A classic clubhouse served on toasted rye bread. 8.oz New York served on toasted french bread & topped with grilled garlic mushrooms. Veggie pattie topped with green, cucumber, tomato, cheddar, mushrooms & ranch mayo. French bread filled with mozza, feta, cheddar & parmesan. Served with house marinara for dipping. Grilled chicken, baby greens, tzatziki, tomato & feta. Tender chunks of Canadian beef stewed with carrot, potato, celery & Guinness jus. crispy chicken fingers served with house fries & dill aioli. Beer battered cod served with house fries and tarter sauce. Mussles simmered in an aromatic white wine & pesto sauce with fresh herbs. Back ribs, finished in your choice of greek herbs & spices or Raspberry demi. House bruschetta served with toasted french bread with dueling pesto. Tender feta cheese wrapped in phyllo pastry, baked and topped with salted honey & walnuts. Lightly breaded squid served with tzaztiki. A new favorite! house lager chips topped with mozza and baked with our own curry sauce. A peasant salad with the addition of chopped romaine. Quinoa, tomato, cucumber, feta, baby greens & house vinaigrette. Prawns and baby scallops tossed in a light lemon cream sauce, bell peppers,onion & fresh herbs. Linguine noodles tossed with grilled chicken, bacon, peas, tomato, mushroom & garlic cream sauce. Penne noodles tossed with bacon, sausage, onion, mushroom & tomato basil sauce. Linguine noodles tossed with rose sauce and baked with mozza & Mediterranean meatballs. Roasted chicken breast stuffed with spinach and feta and topped with a creamy wild mushroom rose sauce. Roasted chicken baked with a feta cheese and drizzled with a white wine, lemon and oregano glaze. Flame Broiled New York steak topped with garlic grilled mushrooms. Blackened New York steak topped with garlic grilled mushrooms. 2 house made patties topped with EVERYTHING! Broiled New York steak served on a french loaf with cucumber, tomato, feta & tzaztiki. Atlantic salmon, pan seared & finished with a maple glaze. Our crispy calamari served with rice pilaf & peasant salad. Layered eggplant, zucchini & ground beef topped with a creamy bechamel sauce. Your choice of chicken, pork or prawn. served with rice pilaf & sauteed Peppers, onion & mushroom. Lightly breaded and finished with mozza, parm & tomato basil sauce. Grape vine leaves stuffed with ground beef & rice, finished with a lemon dill sauce. 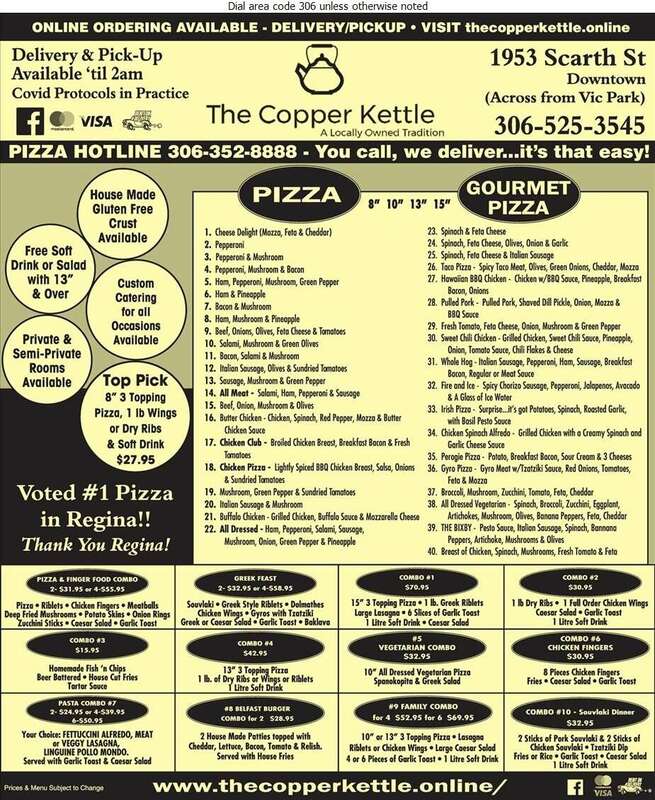 The Copper Kettle Restaurant in Regina has over 43 options on their pizza menu to help you create the perfect pie. Try one of our gourmet pizzas such as Taco, Hawaiian BBQ Chicken, and Irish Pizza. Our pizzas come in 13” to 18” sizes. See our full pizza menu below.